So my due date (Feb 18) has now officially come...and gone....It is now February 20 and still no sign of baby. Unfortunately, I haven't experienced contractions of any sort yet. I can't believe I am saying this, but I want to be in pain...I want contractions...I want to get this baby out! As a friend said on Sunday, "I look ready to burst". I think that pretty much sums it up! 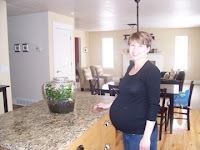 Here is a picture my Mom took of me yesterday..."bursting" with baby. You know you are big when people express feeling sorry for you after taking one look at you. This 40 lbs is becoming more than I can handle! Hopefully the next post will be announcing this little girl's arrival into our family. Hear that little baby??? We're waiting!! Good luck on having the baby soon! We'll be thinking of you!